Confrontations between police and the public seem to be getting worse and worse. After Michael Brown was killed by police in Ferguson, MO in 2014, Cleveland police killed a 12-year-old boy, Tamir Rice, who was playing with friends using a toy gun. Police were only 10 feet away and should never have shot him. Akai Gurley, an unarmed 33-year-old man was shot in the chest and killed by a rookie cop inside a Brooklyn stairwell. Police said it was an accident. In South Carolina, Levar Jones was stopped by police for a seat-belt violation. He was told to get out of the car, and then to show his license. When Jones reached inside his car, he was shot in the hip. "What did I do? I just got my license. You said get my license." In this case, the officer was fired. Recent fatal shootings by police in Minnesota, Louisiana and Wisconsin have reignited debate. What can be done to halt these needless deaths by police? In 1994 Congress passed the Violent Crime Control and Law Enforcement Act, that mandated state Attorneys General begin studying and reporting on excessive use of force by police. Soon after, the Bureau of Justice Statistics developed studies measuring police behavior - not just reports by local police, but with interviews of citizens. What does 20 years of data show? First, the number of people having interactions with the police dropped from 45 million in 2002 to 40 million in 2011. Some 88% of those stopped by police said they thought the police acted properly, as did 83% of blacks. Since 1991, the peak of crime in New York City, the number of yearly shooting incidents by NYPD officers has declined by more than two-thirds. However, The Washington Post reported on Monday that the Justice Department's investigation of Baltimore police resulted in a rebuke for "an entrenched culture of discriminatory policing." It identified a core failure for identifying troubled officers "existed in name only." For example, one officer was criminally charged after he shot at a car as it drove toward him. He had been involved in two prior shootings, had a history of complaints for harassment and excessive force. "The Department failed to respond to those alerts in a way that could have uncovered the officer's condition or otherwise allowed for an intervention," Justice reported. Justice stated that numerous departments failed to use early intervention systems effectively. For example, the Newark Police Department abandoned its early interventions system after only one year and lost track of 100 officers who had been flagged for monitoring. Similarly, the New Orleans Police Department's system was "outdated and essentially exists in name only." However, there are two broad answers. First, an early intervention system needs to be put in place, with rigorous oversight by police leaders. This was accomplished in Minneapolis, New Orleans and Miami/Dade. The result is astonishing - a two-thirds reduction of citizen complaints only a year later in each city. More typical is what happened in Newark. Of 1,000 officers, 100 were identified for monitoring, but the department could not provide documents on what, if anything, happened to them. In 2008, Justice told Austin that its criteria were so open-ended that officers were not being flagged for any violations. The Post reported in the town of Harvey, outside of Chicago, the 71-officers were investigated by Justice in 2012. Justice told Harvey to create an early intervention system that included lawsuits against officers. However, by March, 2014 a federal lawsuit was filed against Harvey and Officer Richard Jones, 47. Kwamesha Sharp said Jones came to her house, wrestled her to the ground, rolled her onto her back an d "kneed her in the abdomen" causing her to miscarry a baby. She was arrested for battery and resisting arrest - for which she was later acquitted. Harvey paid $500,000 to settle a federal lawsuit. However, in January of this year, Jones and Harvey faced another federal lawsuit in which a 20-year-old woman, who said she met Jones in 2015, was pulled her over for driving without a license. He then led her to a weedy gravel lot where he raped her. Jones resigned from the department in July. What's the other solution? 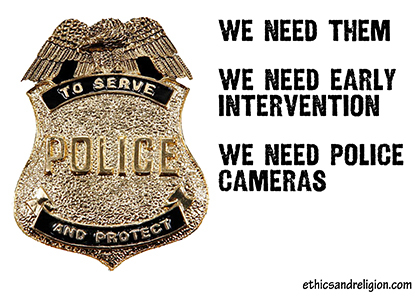 San Diego put cameras on the uniforms of their police. In the last six months of 2014, complaints against officers dropped 40.5% compared to the first six months. And the need for officers to use force plunged 46.5%. Early intervention with oversight and cameras offer hope.